Casinos and game providers have become much more innovative when it comes to free spins and other kind of bonuses online. Since most casinos offer free spins to players by now some actors have come up with more special ways to reward their players. Therefor we have seen more valuable free rounds such as Super Spins a lot recently. These are just like the free spins that you are used to get but the value is much higher which means that you can win bigger! Another more innovative free round is the Super Thrill Spin that can be found in Thrills' casino. This special spin can only be played in games provided by Quickspin. With a Super Thrill Spin you will get right into the bonus round on the specific game that the spins are valid on. This Monday you can win such valuable spins at Thrills where there is an exciting Super Thrill Spin raffle going on and all players are welcome to join! The raffle in Thrills' casino is going on during the whole day and both new and existing members from all countries are welcome to participate. To join the raffle and have a chance to win Super Thrill Spins you just have to qualify for the campaign. You are doing this by playing at least 100 real money rounds on Dragon Shrine from Quickspin. For every time you do this you will get one ticket to the big raffle that will take place in Thrills' casino tomorrow. 10 players will win a Super Thrill Spin that will lead you right into the bonus round in Dragon Shrine. The best part is that you will get into the bonus round with a €/£/$5 bet which means that you can win amazing amounts if you're lucky! It's like Thrills have combined a Super Spin with a Super Thrill Spin and you will have the best condition to win big! This will certainly be a new experience to players who just have experience from ordinary free spins with low value. All winners will get their Super Thrill Spin into the account by 5 pm tomorrow. Thrills is really the online casino to visit this week if you're a fan of free spins just like we are. Later on this week, on Wednesday there is a new campaign going on in the casino. During this day all active players will get free spins with no deposit required. If you're an active member of Thrills you will get no less than 10 free spins to use on Motörhead: video slot, Jimi Hendrix or Guns n Roses. These free rounds aren't connected to any wagering requirements so you can cash out exactly everything you win during your free spins. If you would like even more rounds for free you just have to make a deposit of at least €/£/$50 and you will get to enjoy additional 50 free rounds on the same games that are included in the Netent Rocks collection. These extra free rounds will be paid out to your account during the next day. To qualify for this offer you also need to wager your deposited amount in the casino at least one time during Wednesday. If this is the first time you hear about Thrills you might become interested to know more about about this first class online casino. 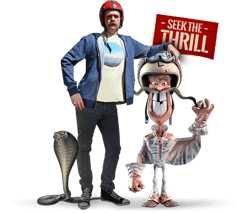 You can actually try Thrills for free with an exclusive welcome offer that this casino is offering our visitors. Just click on any of our bonus links and create an account at Thrills and you will get 10 free spins no deposit to use on NRVNA. After that you can also claim valuable Super Spins and an amazing welcome bonus!